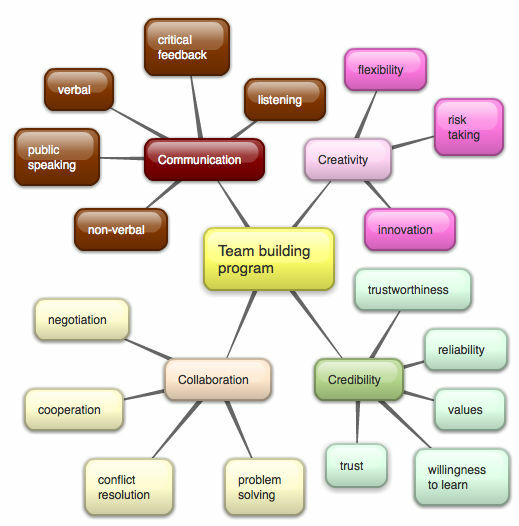 When it comes to designing a team building program you need to include skills development in the specific area in which the team is working as well as skills in being an effective team member. Often the former skill set is the one that is stressed with little attention paid to the latter. It is the level of the team building skills that can often make all the difference to the outcome of the team’s endeavours. These four characteristics are required for a balanced program that will build an effective team. Each of these four Cs have particular skills that need developing before team members will be competent in those areas. Not all teams need all of these skills. Informal teams will not require training in many of these skills. But members of high functioning teams will need competency in all these skills. Communication: Proficiency in these skills is the basis of interpersonal relationships both within the team and with everyone with whom the team interacts. There are many forms of communication so highly effective teams diversify their communication skills. Collaboration: Without the sharing of ideas there is no team just a group of individuals. The level of collaboration sets both the mood of the working environment and the synergy of the ideas. Creativity: Skills in this area will differentiate an ordinary team achievement from an amazing accomplishment. Creativity does not necessarily mean talent in a particular artistic endeavour although it may. It encompasses creative thinking which can lead to innovation. Credibility: It is accomplishment in these skills that will increase the speed of the team’s accomplishments and make the journey they follow more enjoyable. 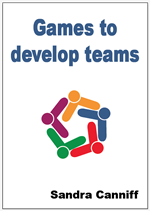 It also aids in the acceptance of the team’s ideas and performance by others. Once you know which skills you need to develop in your team, then you can select games that also are developing these skills. These games will add value to your formal learning.